and durability, colour rich graphics and true edge-edge printing. Fargo HDP5000 colour Ribbons deliver 500 full colour prints while HDP transfer film delivers a highly economical 1,500 prints ! Premium resin black ribbons used for imaging accurate first-time-scan bar codes print in excess of 3,000 cards. The Fargo 084051 colour ribbon, HDP transfer film 084053 as well as the Fargo 084060 premium black ribbon are available ex stock from our distribution hubs in Cape Town and Johannesburg. 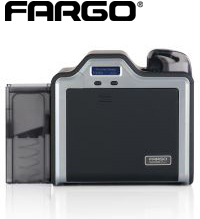 Other secure materials available for this printer include Fargo 084054 Orbit High-Secure HDP holographic transfer film (500 prints) Polyguard Overlaminates for durability and added security include 0.6 mil and 1.0 mil options as well as Orbit High-Secure Holographic Overlaminates. Fargo HDP5000 colour ribbons are shipped with a built-in cleaning roller which saves on operating costs and printer maintenance. All Fargo ribbons are supplied with a standard 2 year warranty backed by Cardworx. in just 5 working days !